EL SEGUNDO, Calif.--(BUSINESS WIRE)--KARL STORZ Endoscopy-America, Inc., a leader in endoscopy solutions and related technologies, has been awarded a contract for its advanced Video Laryngoscopy products by Premier Inc., a leading healthcare performance improvement company. The effective date of the three-year multi-source agreement was March 1, 2018, according to the companies. The contract with Premier will cover a range of KARL STORZ Video Laryngoscopy products providing members with the latest technology solutions for conventional and difficult tracheal intubations of pediatric to adult patients treated in the hospital as well as emergency department and pre-hospital settings. Among the KARL STORZ products that will be available to Premier members are C-MAC® Video Laryngoscope Blades. These reusable blades are available in various styles and sizes for performing neonate, obese and anterior airway intubation procedures. Multiple video laryngoscope options for both routine and difficult airways offer clinicians a choice of airway tools for a wide variety of patients, clinical settings and teaching purposes. Another highlight is the C-MAC® S Single-Use Video Laryngoscope, which is paired with the C-MAC® S Imager for emergency and pre-hospital settings to provide exceptional image quality while requiring no reprocessing. C-MAC® S is the only single-use video laryngoscope solution on the market that is part of a robust, interfacing airway management platform. The C-MAC® monitor, which is at the heart of the KARL STORZ Premium Airway Management Platform, provides dual inputs to allow multiple tools to be ready for patient care which can be especially valuable in the case of a difficult intubation. In addition to the C-MAC® monitor, KARL STORZ also offers the C-MAC® Pocket Monitor, a highly portable device to meet the rigorous demands of the pre-hospital setting. Its 3.5-in LCD monitor fits directly on all reusable and single use C-MAC® Video Laryngoscope blades and functions in direct sunlight. The Pocket Monitor records images and video on its internal memory, and allows data to only be extracted via a proprietary data cable. The ergonomic screen can be moved in several directions and folded away for transportation. “Direct laryngoscopy continues to be the current standard of care. There is now ample evidence, however, suggesting that use of video laryngoscopy can promote enhanced outcomes. The ability to properly visualize the vocal cords during laryngoscopy is one of the most vital factors in ensuring successful tracheal intubation,” says Michael Lyman, Director of Sales and Marketing, Airway Management, Anesthesiology & Emergency Medicine, KARL STORZ Endoscopy-America, Inc. "Among the goals of KARL STORZ to provide a full range of tracheal intubation solutions to help make certain that clinicians are prepared to meet all the unique needs of patients and any complications that may arise. We also strive to help providers achieve the triple aim objectives of value-based healthcare by helping them meet quality objectives and secure improved outcomes for patients while helping to reduce the per capita cost of healthcare delivery.” The CMAC Airway Management Platform from KARL STORZ is the only system on the market that offers a fully comprehensive, highly mobile and affordable video solution. 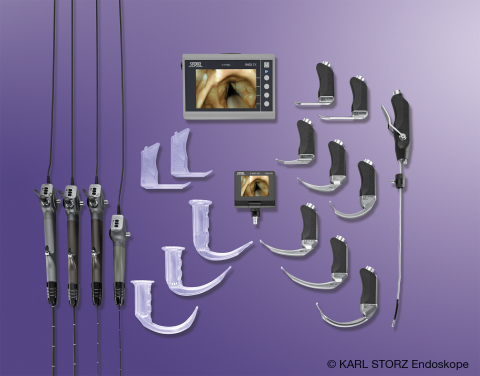 KARL STORZ Endoscopy-America, Inc., is an affiliate of KARL STORZ SE & Co. KG, an international leader for more than 70 years in reusable endoscope technology, encompassing all endoscopic specialties. Based in Tuttlingen, Germany, KARL STORZ SE & Co. KG is a family-owned company that designs, engineers, manufactures, and markets all its products with an emphasis on visionary design, precision craftsmanship and clinical effectiveness. For more information, call 800-421-0837 or visit the company’s Web site at www.karlstorz.com. KARL STORZ Endoscopy-America, Inc., has been awarded a three-year contract for products from its Premium Airway Management Platform by Premier Inc.